It does not need any kind of dry-cooler or cooling tower. Therefore it saves costs, space and diminishes noise. 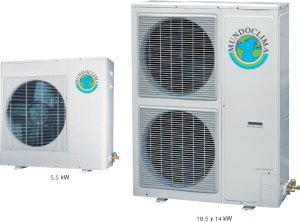 The used indoor units are fan coils that use water instead of refrigerant. This water enters the indoor units by means of the impulse pump. Self protection systems due to: Over current, voltage, water flow, freezing, etc. thus ensuring proper and safe operation. External batteries protected by anti-shock protection grill. Water pump and expansion tank inside, only needs to be connected to the central pipe system. It can be controlled from both the computer and remotely. It can operate in cooling mode below -10 °C due to the low temperatures control installed inside.